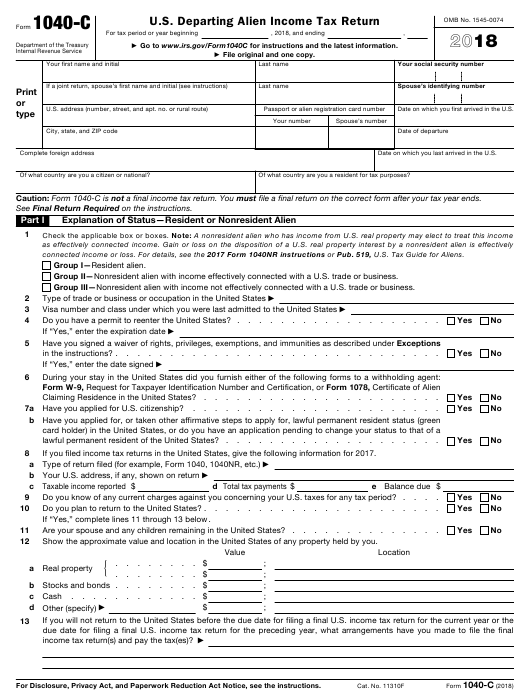 IRS Form EIB-SBA1040-c or the "U.s. Departing Alien Income Tax Return" is tax form released and collected by the United States Internal Revenue Service. The January 1, 2018 fillable version of the EIB-SBA1040-c Form can be downloaded below in PDF-format. The "U.s. Departing Alien Income Tax Return" can be filed digitally and submitted online or printed out and sent to the IRS mailing address. Go to www.irs.gov/Form1040C for instructions and the latest information. File original and one copy. Date on which you first arrived in the U.S. Date on which you last arrived in the U.S.
Of what country are you a citizen or national? Of what country are you a resident for tax purposes? Caution: Form 1040-C is not a final income tax return. You must file a final return on the correct form after your tax year ends. See Final Return Required on the instructions. connected income or loss. For details, see the 2017 Form 1040NR instructions or Pub. 519, U.S. Tax Guide for Aliens. Group II—Nonresident alien with income effectively connected with a U.S. trade or business. Group III—Nonresident alien with income not effectively connected with a U.S. trade or business. Do you have a permit to reenter the United States? . Claiming Residence in the United States? . 7 a Have you applied for U.S. citizenship? lawful permanent resident of the United States? . If you filed income tax returns in the United States, give the following information for 2017. Do you know of any current charges against you concerning your U.S. taxes for any tax period? . Do you plan to return to the United States? . If “Yes,” complete lines 11 through 13 below . Are your spouse and any children remaining in the United States? . Show the approximate value and location in the United States of any property held by you. b Stocks and bonds . income tax return(s) and pay the tax(es)? For Disclosure, Privacy Act, and Paperwork Reduction Act Notice, see the instructions. 14 Total income (from page 3, Schedule A, line 4, column (d) or (e)) . 15 Adjustments. See the instructions and attach appropriate form or statement . 16 Adjusted gross income. Subtract line 15 from line 14 . 18 Credits. See the instructions and attach appropriate form or statement . 19 Subtract line 18 from line 17. If zero or less, enter -0- . 20 Other taxes. See the instructions and attach appropriate form . 21 Tax for Group I or II. Add lines 19 and 20 . 22 Total income (from page 3, Schedule A, line 4, column (f)) . 23 Tax (30% of line 22). If less than 30%, attach statement showing computation . 24 Total tax. Add lines 21 and 23 . Note: Your tax liability on your final return may be different from line 24. A, lines 4 and 5, column (c)) . 29 If line 24 is more than line 28, subtract line 28 from line 24. This is the amount you owe . 30 If line 28 is more than line 24, subtract line 24 from line 28. This is the amount you overpaid. Any overpayment of tax will be refunded only when you file your final return for the tax year . 3 Net gain, if any, from Schedule B, line 2 . 5 Exempt income. Do not include on line 4 .
that was paid or withheld on these sales or exchanges on Schedule A, line 3, column (c). enter this net gain amount on Schedule A, line 3, column (f). • If you are a nonresident alien reporting income on Schedule A, column (e), you may claim only deductions that are connected to U.S.
• If you are a nonresident alien reporting income on Schedule A, column (f), do not claim any deductions related to that income. on Schedule D, line 2 or line 8, whichever applies. Enter amount from page 2, line 16 . Alternative minimum tax (AMT). Enter the amount, if any, of AMT from Form 6251 . Add lines 4 and 5. Enter the result here and on Form 1040-C, line 17 . Enter itemized deductions from page 3, Schedule C, line 2 .